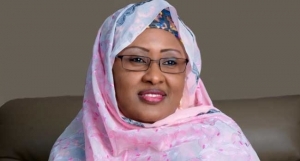 The wife of the Nigerian President, Aisha Buhari, has urged Nigerians to understand their rights as consumers, in order to stand up to market abuses that undermine those rights. She said the rights of the consumer must be protected and those on the wrong side of the law should be made to understand that. “Their rights come to an end where the rights of the consumers begin”, Aisha said. Mrs. Buhari made the remarks in Abuja, during her appointment as Consumer Ambassador of Nigeria, by the country’s Consumer Protection Council, as part of activities to mark the World Consumer Rights Day 2017. Represented by the wife of Nasarawa State Governor, Mairo Tanko Almakura, she thanked the Management of the Consumer Protection Council for the honour bestowed on her. The Director General of the Consumer Protection Council, Dupe Atoki, said digital technology, though beneficial, has exposed consumers to online threats such as cybercrime, data theft and invasion of privacy. Atoki stated that this year’s theme tagged ‘Building a Digital World Consumers Can Trust’ is intended to call attention to these consumer issues. The Minister of Industry, Trade and Investment, Okechukwu Enelamah and the Minister of Science and Technology, Ogbonnaya Onu in their goodwill messages highlighted the important role of the Council in protecting the rights of consumers. The agency said the stakeholders workshop, which is scheduled for Thursday, March 16, 2017 will feature presentations from Google, Microsoft, the Central Bank of Nigeria (CBN) and the Nigeria Financial Intelligence Unit (NFIU), among others.